This is one of those no-brainer ideas that I’m surprised doesn’t exist: you take the classic Mickey Mouse phone and use that as the basis for a cradle/dock for modern smartphones or tablets. At a fraction the size of the original phone, this is essentially a figurine on a stand. 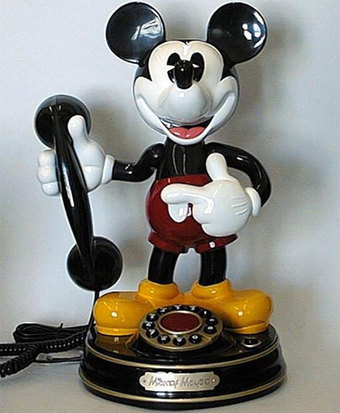 The phone would be held in place by the base/dock, so Mickey wouldn’t have to do any heavy lifting. It would just appear that he is propping up the phone. This cradle would be a great accessory for viewing or charging your device. I certainly would love one on my desk.